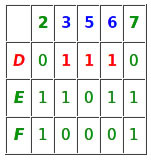 If you have ever tried to create a program for solving Sudoku, you might have come across the Exact Cover problem. 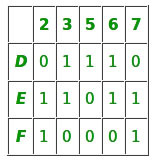 In this article, we will discuss what is the exact cover problem and an algorithm “Algorithm X” proposed by Donald Knuth to solve this problem. Union of all subsets in S* is X. That means union should contain all the elements in set X. So we can say that S* covers X. The Exact cover problem is a decision problem to determine if exact cover exists or not. It is considered to be NP-Complete problem. In the context of matrix representation, our exact cover is the selection of rows such that each column contains only single 1 among selected rows. 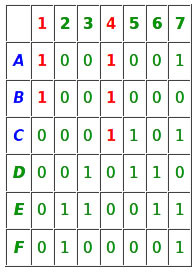 So we can see below that each column have only single 1 among selected rows B, D, F.
Donald Knuth proposed an Algorithm X which can find all the solutions to the exact cover problem. 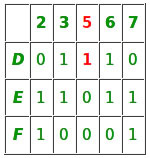 Algorithm X can be efficiently implemented by “dancing links” technique proposed by Donald Knuth called DLX. Algorithm X is recursive, depth-first, backtracking algorithm. It is non-deterministic in nature, that means for the same input, it can exhibit different behaviors on a different run. is a valid solution; terminate successfully. 2. Otherwise, choose a column c (deterministically). 3. Choose a row r such that A[r] = 1 (nondeterministically). 4. Include row r in the partial solution. delete row i from matrix A.
delete column j from matrix A. 6. Repeat this algorithm recursively on the reduced matrix A. The sub algorithm forms a search tree with the original problem at the root and each level k have sub algorithm correspond to the rows chosen in previous level (just like the n-queen search space). 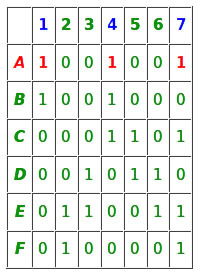 If chosen column c is entirely zero then there are no sub algorithms and the process terminated unsuccessfully. Knuth suggests that we should choose the column with the minimum number of 1’s in it. If no column left, then we know we have found our solution. 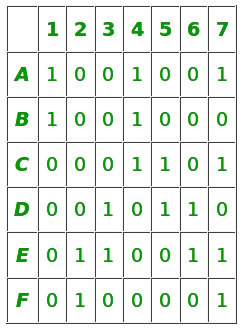 Step-3: Rows A and B have 1 at C-1 so they are selected. C-1 have 1 in row A and B, C-4 have 1 in A, B and C, C-7 have 1 in row A, C, E, and F.
So column 1, 4, 7 and rows A, B, C, E and F should be removed. Since column C-2 have no 1’s in it, our search will terminate here unsuccessfully. 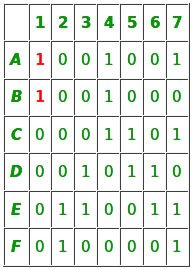 C-1 have 1’s at row A and B. C-4 have 1’s in row A, B and C.
So C-1, C-2 and Row A, B, C will be removed from the matrix. Step-2: C-5 has a minimum number of 1’s in it, so it is chosen. Step-4: Row D is chosen and added to partial solution. At C-3 row D and E have 1, at C-5 row D have 1 and at C-6 row D, E have 1. So these rows and columns should be deleted and we left with a matrix having only row F and column 2, 7. Step-3: Row F have 1 at C-2 so it is chosen. Now algorithm will move to the first branch at level 3. 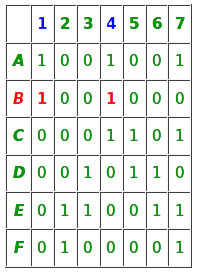 Step-5: C-2 and C-7 have 1 at row F.
sub algorithm backtrack at level 2 and since there is no row left at level 3. It further backtracks at level 1 . Since at level 1 there is no row left to our algorithm terminated. In next article, we will discuss how to implement DLX efficiently to solve Exact Cover.